Are you suffering from back problems? Pain doesn't let you sleep and work, and pharmacological treatment is ineffective? Are you physically active, but a recurring injury prevents you from training? Or maybe the problem lies in headaches? We perform spine rehabilitation, post-traumatic rehabilitation and postural rehabilitation. We treat back pains and other painful symptoms accompanying pregnancy. We adopt the standards recommended by the International Academy of Orthopedic Medicine in our diagnostic and treatment. We use clinical tests to accurately determine the cause of pain as well as physiotherapy methods based on scientific research (Evidence Based Medicine in Physiotherapy and Rehabilitation), such as: manual therapy (IAOM, Ackerman's method), therapeutic massage, transverse friction massage, functional training. 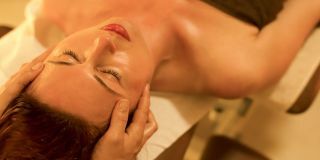 Furthermore, we use osteopathic methods of work: cranio-sacral therapy, visceral therapy, direct and indirect techniques of pain treatment as well as relaxation therapies and massages (Ayurvedic massages), respiratory reeducation and other methods that will help you regain fitness and the joy of life. Caring for the well-being of our patients, we are constantly expanding our qualifications and skills and updating our knowledge. We will be glad to introduce to you the full scope of our services! Osteopathic techniques: visceral therapy, cranio-sacral therapy, BLT, direct and indirect methods of work on fasciae.